When Hiram H. Hammond of Postville, Allamakee, Iowa died in 1896 at the age of eighty-three, the local newspaper stated, “By constant application to his farm and frugal habits, Mr. Hammond acquired a comfortable competency.”1 Although it is believed that he was born in Belmont County, Ohio, little is known about Hiram Hammond before his debut as a farmer in northeastern Iowa.2 It is there that the paper trail begins, and agricultural schedules, an underutilized resource, offer fantastic detail about his experience. By 1854, Hiram had moved on to nearby Clayton County, Iowa, where he married a German immigrant, Eva Margaret Stöhr, and started a family. In the years to come, Hiram saw success as a farmer,6 and, although seemingly absent in 1860, he appeared in the 1870 and 1880 U.S census and agricultural schedules. In 1870, Hiram, 57, lived with his wife and five children under the age of twelve.7 His farm was valued at $2500 and his livestock at $1400; he possessed 180 acres of land, the majority of which was woodland. Hiram also owned fourteen sheep, eight horses, seven swine, seven cattle, and six milch cows. He produced 300 pounds of butter, and 75 pounds of honey.8 In 1880, his farm was valued at $3240; although his acreage was smaller than in 1870, more land was in use. The value of his farm productions of the past year came to $1461.9 All told, this was a far cry from Hiram’s first appearance in the agricultural schedule. How can you learn more about your ancestor’s farm? Agricultural Schedules were recorded from 1850-1880, and provide a wealth of information about the land, livestock, crops, and other farm productions, from butter and cheese to maple syrup and honey, of your ancestor. Search for your ancestor through “Selected U.S. Federal Census Non-Population Schedules, 1850-1880” on Ancestry.com. Be aware that the agricultural schedules may span two pages, and consider comparing your ancestor’s farming operation to those of their neighbors. How did they measure up? 1 “Gone to Their Rest,” The Graphic (Postville, Iowa), 27 August 1896, p. 1, col. 3; digital images, Newspaper Archive (http://www.newspaperarchive.com : accessed 23 October 2013). 2 “Gone to Their Rest,” The Graphic (Postville, Iowa), 27 August 1896, p. 1, col. 3. 3 U.S. Bureau of Land Management, “Patent Search,” database, General Land Office Records (http://www.glorecords.blm.gov : accessed 23 October 2013), entry for Hiram Hammond, Dubuque land office, doc. no. 4358. 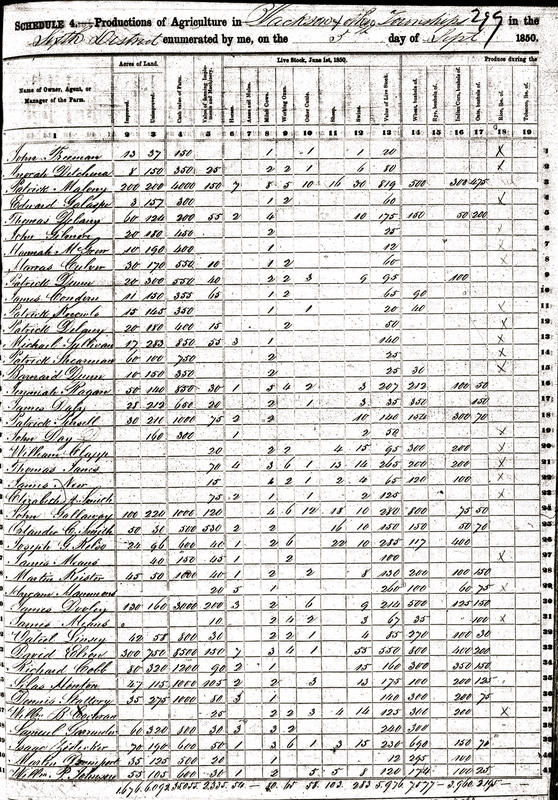 4 1850 U.S. census, Jackson County, Iowa, population schedule, Jackson, sheet 294-B, dwelling 187, family 187, Hiram Hammons; digital image, Ancestry.com (http://www.ancestry.com : accessed 23 October 2013), citing National Archives microfilm M432, roll 124. 6 “Gone to Their Rest,” The Graphic (Postville, Iowa), 27 August 1896, p. 1, col. 3. 7 1870 U.S. census, Clayton County, Iowa, population schedule, Volga, p. 6 (penned), dwelling 39, family 40, Hiram Hammond; digital image, Ancestry.com (http://www.ancestry.com : accessed 23 October 2013), citing National Archives microfilm M593, roll 383. 10 “Gone to Their Rest,” The Graphic (Postville, Iowa), 27 August 1896, p. 1, col. 3. 11 “Farm for Sale,” The Graphic (Postville, Iowa), 29 June 1893; digital images, Newspaper Archive (http://www.newspaperarchive.com : accessed 23 October 2013). This entry was posted in Uncategorized and tagged 1850s, Hammond, Iowa on October 23, 2013 by Melanie Frick.